Park City’s best spots for sports and suds. The place is brimming with sports bars and restaurants featuring big screen TVs and good vibes, not to mention excellent food and libation. In Kimball Junction, Red Rock Brewery (435.575.0295, redrockbrewing.com) offers up award-winning microbrews; Maxwell’s East Coast Eatery (435.647.0304, maxwellsece.com) sports the biggest bar in town and a great Bloody Mary bar on Sundays; and Molly Bloom’s (435.645.0844) offers Irish flair and fare. All are terrific places to watch the race, game, match, or tournament. 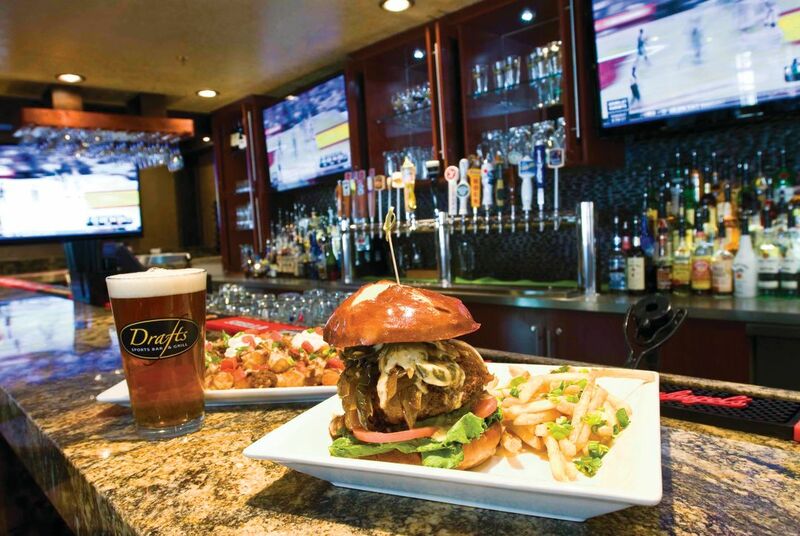 There is no shortage of bustling spots to watch the big game in Park City. A bit farther out of town in Quarry Village, O’Shucks Bar & Grill (435.658.1144) is a family-friendly bar and grill serving up some of the best burgers in town, not to mention sushi from Ahh Sushi next door. It’s the perfect spot for your college football or basketball fix with plenty of parking. Brand new this fall is Drafts Sports Bar & Grill (435.655.2270, draftsparkcity.com) at Canyons Resort, offering nine big-screen TVs, 20 beers on tap, beer flights, and heartily portioned appetizers like totchos (tater tots with nacho toppings). In Old Town, the Wasatch Brew Pub (435.649.0900, wasatchbeers.com) has been a go-to locale for sports aficionados since opening in 1989. The upstairs Brew Pub Cantina features several screens on which to watch games, not to mention Wasatch’s award-winning beers. The 55-inch flat-screen TV at No Name Saloon & Grill (435.649.6667, nonamesaloon.net) brings the action right into this popular Main Street bar. While you’re watching, be sure to sample the killer buffalo burgers. A little farther down Main, pop into Doolan’s (435.649.0888), a dedicated sports bar with flat-screen TVs everywhere you turn and excellent cocktails and sports-themed foods like the Pig Skin Burger, Triple Play Club, and Viking Chili-Cheese Fries. Or, if you’re strolling lower Main Street, belly up to the bar at Butcher’s Chop House & Bar (435.647.0040, butcherschophouse.com), where the bartenders are the best in the business, and there’s always an important game to watch while you nibble and imbibe.